LOS ANGELES, California (CNN) -- Firefighters continued to battle a fire in southwest California that ripped through the hills and rugged canyons of Ventura County, threatened hundreds of homes and prompted Gov. Arnold Schwarzenegger to declare a state of emergency. Strong wind, grass and light brush are fueling the Guiberson fire in southwest California. By late Tuesday, firefighters -- 600 strong -- had contained 10 percent of the blaze as lashing flames ravaged 8,500 acres. 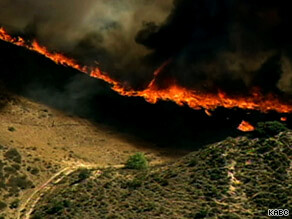 The Guiberson fire, as it was named, broke out Tuesday morning between the towns of Fillmore and Moorpark. By nightfall, the fire had destroyed two outbuildings and threatened 1,000 structures, the county fire department said. Two firefighters were hurt, both suffering heat- and smoke-related injuries. Officials feared the fire could breach pipelines connected to pumping rigs in the area's oil fields. If that happened, workers would cut the oil flow to prevent fire from spreading through the lines and causing an outburst of flames in another area, said fire spokesman Bill Nash. Officials expect to know by Wednesday morning what ignited the fire. But it was clear what fueled it: strong winds, 100-plus degree temperatures, dry grass and light brush. By Tuesday night, winds had weakened. A second fire, in Riverside County, was expected to be contained by Wednesday morning, said Capt. Mitch Wesche of the Riverside Fire Department. That fire burned 160 acres and caused minor damage to a residence, he said. Two firefighters also suffered minor injuries. Riverside County is southeast of Ventura County. CNN's Khadijah Rentas, Sonya Hamasaki and Lynn Lamanivong contributed to this report.